I’m sure you’ve all seen news that 3Dconnexion released their new SpaceNavigator for Notebooks today and I’m not going to waste your time with another review of how “life changing” it is to find crap in Google Earth. I did receive a review unit from 3Dconnexion with the idea that I would look at how it works with ArcGIS Desktop and other professional applications that I use. I’ve already reviewed the “full size” SpaceNavigator and come to the conclusion that it does improve productivity with ArcGIS (enough so that we’ve bought units for our GIS Analyst staff) in both 2D and 3D. So what does SpaceNavigator for Notebooks bring to the table? First, it is smaller. Many of you have seen the graphics that show how much smaller the unit is. Usually when things get smaller I have trouble using them. Small mice make my hands cramp up so I was somewhat worried that the new unit would fall into the same trap. Thankfully that wasn’t the case, the SpaceNavigator for Notebooks works well enough in my hand to be used every day with ArcGIS Desktop. The control seems even better. I’m not sure how to describe it other than the tilt function works better than the standard SpaceNavigator. I’m not sure if this is the case because the SpaceNavigator for Notebooks has a new mechanism inside or my existing SpaceNavigator has become worn with use. 3D control of ArcGlobe and ArcScene is as good as ever and of course you still have that great 2D control in ArcMap. As I’ve said before using the SpaceNavigator in your left hand and using the mouse with the right hand is much easier than trying to use the mousewheel to navigate ArcMap. The SpaceNavigator for Notebooks comes with a leather case for travel, but I lost that at the Developer Summit last month so I’ve just been throwing it in my notebook bag. The case was nice, but isn’t really needed as there are no loose parts. The smaller size works well while on the airplane, fitting next to my smaller travel notebook on the seat tray, but if you’ve got a larger notebook you’ll still run into trouble. The USB cable is just about the right size, short enough to not be a hassle while traveling, but long enough to use when you are back in the office. Now what I did have a problem with was the lighter weight. At first I found myself lifting the unit off the table and sliding it around. I’ve gotten much better at the lighter unit as I’ve used it over the last few weeks, but be warned that if you are rough with the existing SpaceNaviagator, you’ll have some teething problems with the new one. Other than that, it works just like its larger brother. The full list of supported applications is here. One thing that needs to get addressed soon is “certified driver” for ESRI products. Now it isn’t that the driver for ArcGIS Desktop doesn’t work, because it works very well, but I just would rather have ESRI and 3Dconnexion work at getting an “officially supported” driver out soon. Now is the SpaceNavigator for Notebooks worth the extra money ($129)? I’ve seen some reviews say the price twice the SpaceNavigator PE ($59). Now while that is true, the SpaceNavigator PE can only be used in “education or personal use” situations. 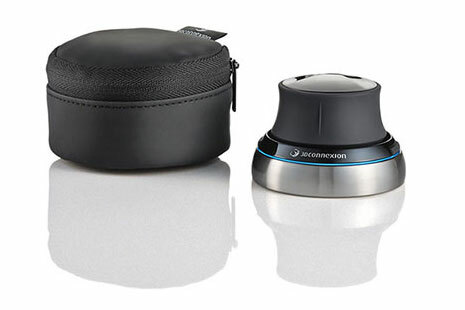 The SpaceNavigator SE is $99 and has a “professional” license so that is the unit that needs to be compared to the SpaceNavigator for Notebooks as it also has a “professional” license. I think most professionals won’t balk at an extra $30 for portability and if you are a road warrior, weight savings can be critical. If space and weight have been a problem with your SpaceNavigator, you might want to take a look at the SpaceNavigator for Notebooks. DISCLOSURE - 3Dconnexion provided me with a SpaceNavigator for Notebooks for evaluation.